For the longest time that I was involved with boxing, not once was I handed the rare opportunity to see two fighters I helped get to a world title fight battle each other for a world title belt. But, that is exactly what fate has given me as the cutman for both Donnie Nietes and Aston Palicte. I had been Donnie Nietes’ cutman since the days Nietes was a 105 pounder fighting in the gloomy venues in Mexico. That was almost a decade ago. 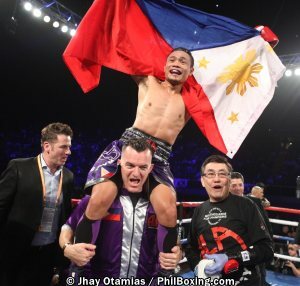 Ever since that time, I had many opportunities helping Nietes as he battled his way through the 105 lbs. and 108 lbs. titles and recently, the 112 lb. title as well. Then there is Aston Palicte. I was also Palicte’s cutman in his two fights in the US that earned him the number 2 ranking in the WBO Super flyweight division. Nietes is a former minimum weight (105 lbs), junior flyweight (108 lbs.) and flyweight (112 lbs.) champion. He won the 112lbs. crown via a scintillating knockout of a former champion from Argentina, Juan Carlos Reveco. He recently gave it up and climbed to 115 lbs. so he can have an opportunity to win 4 world titles in different weight divisions like Manny Pacquiao. When he climbed to 115 lbs., WBO rated him No. 1 challenger to the crown. But the crown is currently vacant so that leaves him to fight the No. 2 guy who happens to be Aston Palicte. Palicte, is a legitimate super flyweight who earned the No. 2 ranking and right to fight for a title via victories over Jose Alfredo Rodriguez and Oscar Cantu at Texas and Nevada respectively. Given that Nietes and Palicte are ranked No. 1 and 2, WBO mandated them to fight for the crown. When that was announced, there were lots of mixed feelings from the boxing fans in the home country. On one side of the coin, people were saying why fight each other when there are lots of other fighters to fight who are not Filipinos. The others who had different opinions however were ecstatic. They say that Filipinos boxers have now risen to a point where many are title contenders. Therefore, they must fight like the Mexicans do. Initially, the fight was scheduled at Cebu, the hotbed of Philippine boxing. 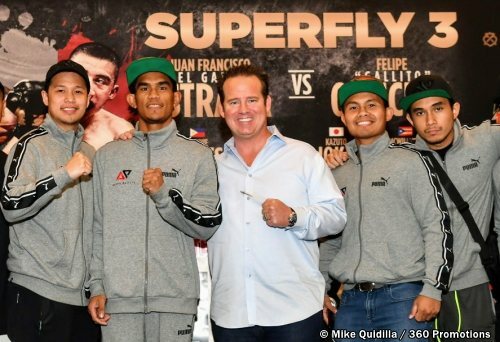 However, Tom Loeffler of 360 Promotions that promotes the “Superfly Series” on HBO offered to put the fight as an undercard of the Juan Francisco Estrada vs. Felipe Orcuta battle on Superfly 3. Thus, the Nietes-Palicte Fight will now be shown live on HBO, a platform that will give both Nietes and Palicte a worldwide audience. Since I been involved with both Nietes and Palicte, folks had been asking what I think about the fight. So for all those who asked, here is what I think. Nietes is an old sly fox. He has honed his skills through the years and has fought many named fighters some of whom are much taller than him. He has a complex defense to solve and his offense is tremendous. He has an incredible control of his output. He can increase it if needed or he can just content himself with throwing limited but effective counterpunches until he finds an opening and throws his famed uppercut that toppled many fighters that faced him. I have no doubt he can land on Palicte in spite of the height difference. But he is climbing to a weight division he has never been before. Therefore, the biggest question is if he can carry his power to the 115 lbs division. I personally think that if the fight goes the distance, Nietes holds the advantage. Palicte on the other hand is young, strong, taller and naturally bigger and more importantly very hungry to win his first world crown. His biggest advantages over Nietes are his reach, size and natural power. He has always fought at 115 lbs. 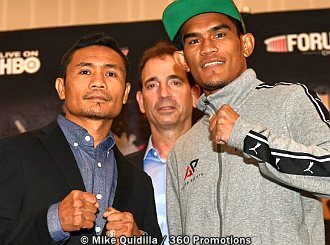 On fight day, he may come in between 122-125 lbs., making the size difference really in his favor. My only concern for him is if he can overpower Nietes and hit him with bombs Nietes never tasted before. Rodel Mayol, his trainer has found ways to teach Palicte several punches many have never seen Palicte throw before. And, he has also improved his staying power, thanks to conditioning man, Stanley Godinez. If Palicte finds a way to consistently land his power shots, Nietes may succumb to the beating before 12 rounds are over. If Palicte controls the pace and lands his big bombs, he may win by stoppage. So there you go. I must warn you however, many times I have been wrong in making predictions. I must confess I am far better in making great mouthguards than making predictions in boxing. Both Nietes and Palicte can testify to that as they will climb the ring on Saturday wearing mouthguards I custom made for each of them. I would not be surprised if my prediction will be wrong again this time. But you folks asked so I gave you what I thought the results would be. Incidentally, I will not be at any of the two corners. My business sense tells me I must make a choice because there is good money to be made in this fight as a cutman. But my soft side tells me, I should just seat by the ringside and enjoy the fight. See you guys on Saturday. Oh, please buy your tickets and don’t expect freebies.